From these photos it seems that in some birds at least, the movement of the neck is not restricted by the soft tissue that envelopes it. Is it possible that the neck is held in such an odd posture to keep the center of mass closer to the body? It seems the birds we have been seeing here “i.e. the parrot, shoebill, or the heron” a have a larger head to body ratio than say, an emu or ostrich. It could be beneficial to carry the head and neck tighter to the body for balance. If you notice, in your two images with the necks extended away from the body the the body itself is tilted up thus keeping the center of gravity closer to the center. It almost reflects your sketch in your previous post of the bipedal Mamenchisaurus minus the tail. Oh, I am an avid reader and first time poster. I should also mention I am an artist and designer that focuses most of my personal work on dinosaurs, so I am more of a layperson than others posting. It may be that my observations are obvious, so be gentle it’s my first time. Thanks for chipping in, Nick, I hope we’ll be hearing plenty more from you. Everything you say make sense, including the observation that the liefulness of a bird’s neck seems to correlate pretty well with the proportional size of its head. The center of gravity thing is an interesting observation. I’ve always assumed that a big reason why some birds have necks that can collapse into hammer-space is so that they can make themselves look smaller, to better escape the notice of predators or humans. Great blue herons for instance don’t really need to look small (at least around here, there isn’t really any predator that will mess with them, including people), but a greeny or a bittern is a tiny little thing that needs to disappear into the foliage when startled. Interesting irony that the spoonbill in the title isn’t mentioned in the text. Now fixed. Thanks for spotting. I checked some images and spoonbills can lie too, though apparently not too often; they seem to hold their heads high most of the time. Have a look at boat-billed herons though, they are really good at hiding their necks, even when they hold the body near vertical they seem to only occasionally extend the neck. 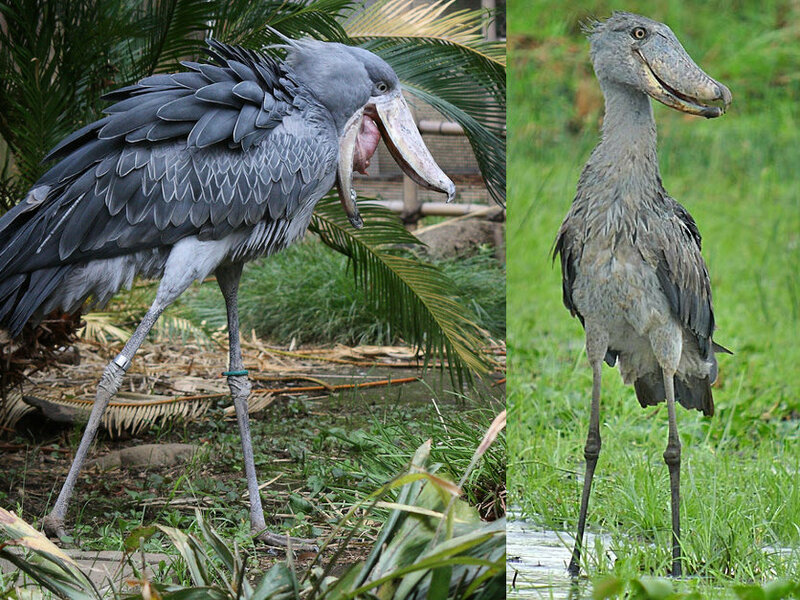 And I think Nick is right about the centre of gravity; because of the size (and presumably the weight) of their bills it looks like it would be difficult for a boat-bill or a shoebill to extend its neck far forwards without over balancing or at least tiring the neck muscles. 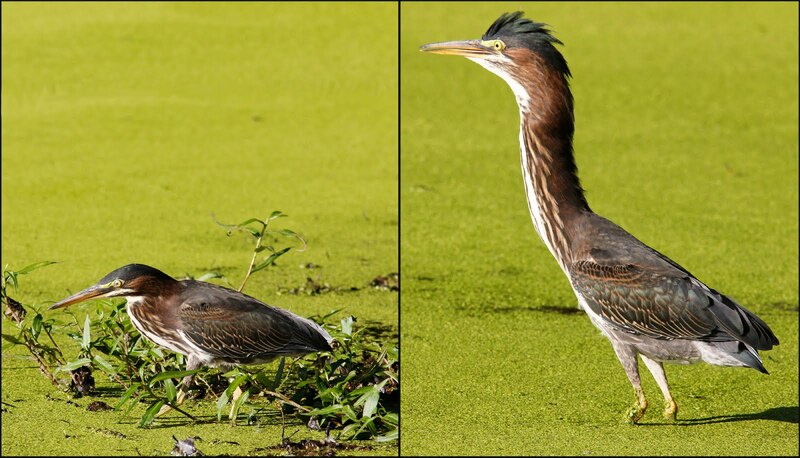 That heron’s neck just looks nauseous-crazy. From no apparent neck to doubling its body length with an extended neck. Given all the bizarre stuff that birds can do with their necks, it’s a bit sad how so many sauropod papers take the tone of “sauropod necks couldn’t even do a little bit of this, or that”. IMO something’s far more wrong with THAT picture. The Shoebill is a less extreme case, but still pretty amazing how it can retract its neck so far. I find it ironic that the species name is rex, it definitely reminds me of a T. rex in the left photo, with a strongly s-curved neck, ready to strike at some Didelphodons messing with her nest. This series is interesting but seems to not regard some of the soft-features of the necks of the given birds. Many of the aspects of neck structure are, in fact, constrained by their subintegumental anatomy, something only weakly touched on to date. This includes ligaments and tendons, muscles — and yes, that old canard, bony stops (it’s what helps form the anhinga/heron “crook,” which remarkably DOES follow the superficial appearance). Much of the commentary has instead focused on the bony versus feathered shapes of the neck, ignoring the intermediate levels of anatomy, which means it is only half of the potential data, and hardly even comparable. This includes a thickened “nuchal” region in some birds, which while elastic does somewhat constrain the extensibility of the neck. In some cases, this extensibility can be apparently “increased” while the neck is rotated around, as in the ability of some really-long-necked birds like owls and parrots to “extend” and “twist” their necks, which is in part also related to the multitude of short vertebrae. It is being argued, without primary data, that this is in spite of the soft-tissue, as though the feathers constrain anything. They don’t: the necks do not lie, but rather we deceive ourselves in thinking that the external appearance is somehow a constraint on neck mobility. It is being argued, without primary data, that this is in spite of the soft-tissue, as though the feathers constrain anything. They don’t: the necks do not lie, but rather we deceive ourselves in thinking that the external appearance is somehow a constraint on neck mobility. As a simple matter of fact, you are wrong. No-one has argued that the feathers constrain the mobility of the neck. The whole point of the “necks lie” posts is not about mobility constraints, but rather that it is often impossible to tell what the vertebrae are doing from looking at the external appearance of animals. And in that sense–the one we intended, clearly spelled out, and have been using all the while–these necks most certainly do lie. And our inability to see what is going on inside the neck leads to the perception that necks are held relatively straight when they are not. Also it is not only the vertebrae that do strange things, can you imagine what the trachea and carotid arteries of short necked tarsiers must do when they turn and look backwards over their shoulder. Furthermore our inability to see soft tissue structures leads to us making simple assumptions, such as that creatures with many small vertebrae in long necks must have more neck mobility than creatures with few neck vertebrae in short necks; this may be generally true but there seem to be exceptions, compare the neck of a tarsier with that of the elasmosaur Albertonectes which appears to be so stiff that it snapped into sections despite having the most cervical vertebrae known. So at the very least necks mess with our perceptions.